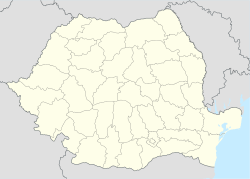 Rădăuţi is a municipality of Suceava County in Romania. 27,759 people live in Rădăuţi. Rădăuţi can be found in Bukovina, between the Suceava and Suceviţa rivers. It is 23 miles north of Suceava. ↑ "Suceava County at the 2011 census" (PDF) (in Romanian). INSSE. February 2, 2012. Archived from the original (PDF) on June 4, 2013. Retrieved March 12, 2012. Wikimedia Commons has media related to Rădăuți. This page was last changed on 24 May 2018, at 12:47.